A bottle of homemade cinnamon sugar. 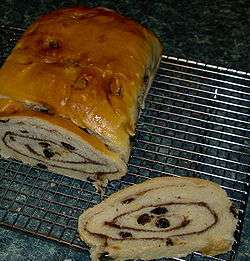 Raisin bread with cinnamon sugar swirled in the dough. Cinnamon sugar is a mixture of ground cinnamon and granulated sugar used as a spice for desserts. It is commonly used to flavor foods such as Belgian waffles, Snickerdoodle cookies, churros and coffee cake. It is also found in breakfast cereals such as Cinnamon Toast Crunch.